My name is Jon Negroni and I’m a writer of books, pop culture theories, and entertainment reviews. I also make YouTube videos and host a weekly podcast called Cinemaholics. When I finished college at 21, I decided to make a blog that could be about anything I want, so here we are. 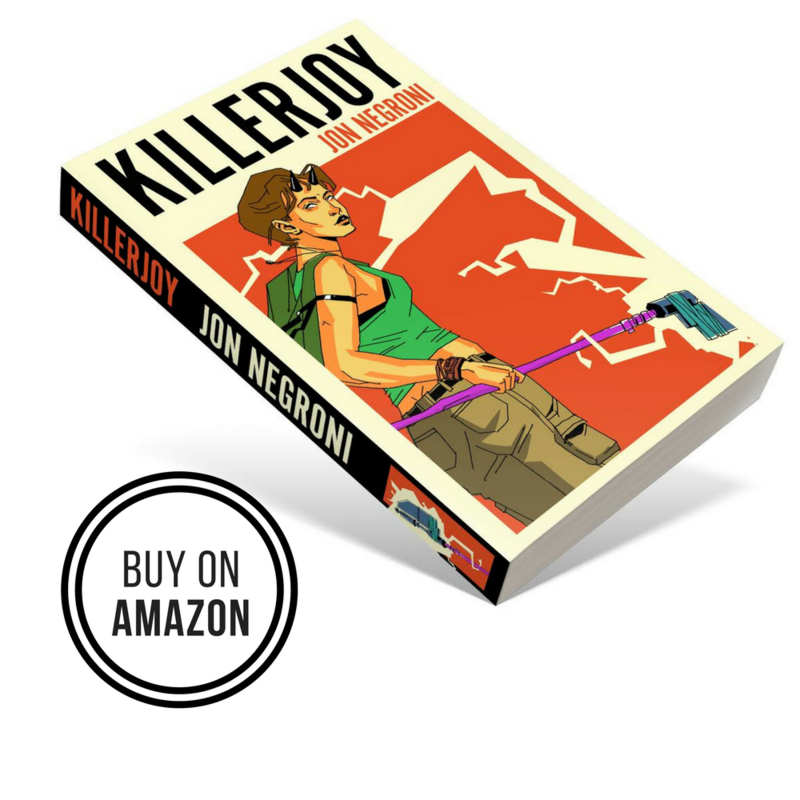 My latest book is Killerjoy, a fantasy adventure novel that combines everything I love about superheroes and comic books with traditional high fantasy. My first book was The Pixar Theory, based on the viral blog post I wrote here in 2013. Since then, the book and the blog post have been read by hundreds of millions around the world and in dozens of languages. I started this blog in 2012 to write about all the things I care about. Naturally, I gravitated toward some of my biggest passions: film and entertainment. By day, I’m a copywriter based out of the Bay Area (which I call the Internet, California). But by night and very early morning, I overanalyze movies on this platform. To become a film critic, I had to do the typical work (study journalism, take some film school courses, cry in my sleep, etc.) But I’m much more interested in some of the nonconventional ways I can share my love of movies with you. That includes some of the videos I make, along with various editorials like Snarcasm. More recently, I’ve decided to shirk the conventional “movie review” in favor of more personal writings about the movies I watch and why I think you should care about them. I always try to search for the hidden meanings behind the best (and even the worst) stories. I get a thrill out of exploring incredible fan theories, tackling the worst articles of the Internet, and more. There’s plenty of nonsense, but hopefully some insight here and there. Join my mailing list! You’ll receive personalized emails from me every once in a while. Follow me on Twitter! I Tweet my latest posts and make bad jokes. Check out my portfolio! Just in case you’re curious. Send me a friendly message! Email jonnegroni@gmail.com for any and all inquiries. Let me know if you have any questions or comments about the site, so I can improve it as we go from here. Thanks for reading and enjoy the words. 140 replies to Who am I? The teacups and teacup set from Beauty and the Beast are in Tarzan. In fact, may things from that scene are from beauty and the beast. They are at Jane’s camp. Cool point 🙂 Maybe they’re antiques or were passed down? Can you do a review on the movie Nacho Libre please? Did you know that the inspiration for the way Tarzan moves in the trees was skateboarding? It’s true! My mom’s friend’s husband was the person trying to figure how he was supposed to move. Then he watched a skateboarder, then inspiration struck! Don’t believe me? Watch the movie and imagine him as a skateboarder. My name is Ulises And i´m liked your work abaout of the Pixar theory, and I have to investigate this team. One frriend and me discovered one simple theory that ago the pixar´s history as changed because it´s infinity. Every time that Pixar entertaniment reveals a new movie like a Inside Out for example or Big Hero 6 it´s created a new fragment to the history and revelated more secrets in the theory. if you want interesting abaout of my idea you can contacme in Facebook. and Again repeat I´m fan of your Work. and i´m go im peace. I run a site that focuses on millennial bloggers and vloggers. I wanted to confirm that you are a millennial (born 1980-2000). We’d love to reblog some of your posts in the future. I think our readers would enjoy it! In That’s So Raven (Disney) , where she kisses the first Devon is called Pizza Planet . Do you think the series of the Disney are part of the Theory of the Pixar? I am sorry if this sounds rude but please answer me one question how old are you? I’ll be 25 this month. Do the toys, monsters and animals have emotions like in inside out? My art publication is doing an issue on interpretation as a powerful creative act, and we would love to do a short interview with you. Your Pixar Theory is a moving example the sort of work we’re after. If you have just a bit of time to spare you would make this fan’s day. Please do let us know at thomasnlaprade@gmail.com. Thanks and keep it up! Loving it man, keep it up! Thank you so much for your Pixar theory. My son loves it! He looks for references in all of the movies and loves to describe the connections. I believe that this has taught him about complexities in film and will, hopefully, lead to a lifelong appreciation! I watched Monster University and believe i have found another A113. In the end of the movie we see the inside Mike’s locker inside the mailroom of Monster Inc. There are tickets for something that are seen in two different shots that follow each other. The first ticket in the first shot shows 13 and the second ticket in the second shot shows A11. The numbers are both on the same area of the tickets. Do you think it’s random or another A113 given by Pixar? Your gravatar needs an update. The link leads to an old .wordpress.com site. I put up a screenshot here = https://faeriefiles.wordpress.com/2016/02/28/jon-negroni/ if you want to take a look. Thanks for visiting my site. It should work now. Thank you for pointing this out! You have to go to gravatar and remove the .wordpress.com as an option. Hi, I was wondering, why do you suppose Riley’s Mom has two different names? On her credit card, it says “K. Ann Andersen”, but in the Essential Guide to Inside Out, it says her name is Jill. Could there be some secret story we don’t know about that fits in with the Pixar Theory? So I was just reading your Pixar theory , which is perfect !, and I was just wondering if this could be a possibility. As you see in brave how the Witch (boo) turns people into animals and can basically teleport to any place In time , could it be possible that she went through time and turned people into animals through out time? That’s how they have certain animals at certain times. And the villain from up (forgot his name , sorry) discovers a talking animal (Doug or anyone) and becomes obsessed and makes the collars for the dogs. Hi, Jon! Could you please tell me which wordpress theme are you using for your blog, because i would want to use on my blog when i start it. Pingback: Eroica Fenice - The Pixar Theory, ormai una certezza?